Een van de doelen van een Scrum Master is om van een groep individuen een presterend team te maken. De focus van een Scrum Master ligt daarbij op om continue de kwaliteit van de interacties tussen leden van het Scrum Team en haar omgeving te verbeteren. Als een Scrum Master hierin slaagt dan zal de waarde die geleverd worden door het Scrum Team toenemen. Dit is makkelijker gezegd dan gedaan. Robin van Gaalen heeft vandaag een prestentatie gegeven over teambuilding. Hiervoor gebruikte hij ook een Tuckman model, alleen hij gaf deze op een andere manier weer. 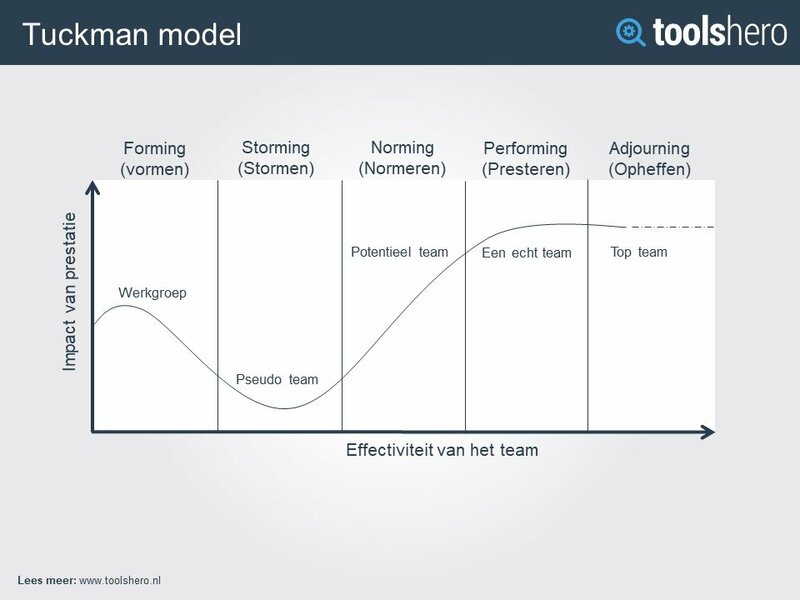 Een team zal constant in de loop zitten Storming > Norming > Performing. Totdat het team het doel heeft behaald bijvoorbeeld na het behalen van de doelen. Je zal dan uit elkaar gaan en starten met een nieuw team voor nieuwe doelen. Hij is momenteel bezig met de voorbereiding voor het Nederlandse Waterpolo team mannen dat in 2020 in Tokyo mee zal doen aan de Olympische spelen. Hoe kan een Scrum Master het Tuckman model gebruiken ? Wat zijn de voordelen van het model ? Wat zijn de (mogelijke) nadelen van het model ? Hoe herken je in welke fase het team zit ? Did you hear of the beautiful tropical bounty island in the middle of the ocean ? The weather is always perfect and everything is in balance. They call it Scrum bounty island and is perfectly discribed in the Scrum Guide. So what kind of benefits would this place bring ? There is a close relation between the progress/succes of the Scrum implementation and the maturity of the Scrum Master role. I want to become the “expert” in the Evolution of the Scrum Master, so we can all live on that Scrum bounty island. It also started me thinking: what if we can get more Scrum Masters to the “expert” level ?Then could we have a happier world ? In my road to achieve Scrum Mastery I want to improve myself as a Scrum Master. How do you know what the next step for improvement is ? First you need to make transparent where you stand as a Scrum Master before you can inspect the next step in the evolution of the Scrum Master. How do you make transparent on which level you act as a Scrum Master ? Ask for feedback of course! I prefer asking feedback on a regular basis face to face, but I’m also a fan of a data driven approach. As I’m writing this blog, tomorrow will be my last day as Scrum Master for my current client, I want to make transparent on what level I’ve been acting. That’s why I am using a tool called the State of Agility. What is the State of Agility ? It is a 360 degree feedback tool to assess me in my role as a Scrum Master. You can also see it as an agile selfie. I asked different people to give me honest feedback by filling in the survey. The outcome of the agile selfie is based on the evolution of a Scrum Master. As you can see my peers gave a rating that differs from my own perspective and I have to admit: that did hurt my ego. My peers rated me as a “coach”, but I assessed myself as an “advisor”. These terms are described in the Evolution of the Scrum Master and also explained in the State of Agility. Why dit it hurt my ego ? Because I work as an Agile Coach at Prowareness, so I expected that I at least act on the level of “advisor” / “expert”. This is something I want to proof to myself that I’m capable of doing. Now the outcome of the assessment didn’t meet my expectations: I wanted to be open about my performance and combine this with a promotion of the tool a State of Agility, but after this outcome I wasn’t so sure. My mind was telling me: “I can’t be that open and put it online in a post, because then people may see me as a fraud.” Or “what would the client think ?” I also noticed that I wanted to explain what the circumstances where that led to the lower ratings of my peers. All kinds of obstructing thoughts, that were preventing me from continuing to write this blogpost. Convert your obtrusive beliefs into empowering convictions! For me this was a very confronting situation containing a big contradiction. It’s my job and purpose to make things transparent. ie. Help the Scrum Team to make transparent what is helping them and what is slowing them down, in their effort delivering a done increment . Being a Scrum Master is all about creating transparency, but when it gets personal I’m trying to be less open and less transparent. This was food for thought! Last Friday I participated in an workshop, given by Chris Hazeu and Matthijs de Booij about creating a new mindset with empowering convictions. I recognized my obstructive beliefs and I wanted to challenge them with a powerful conviction. So I asked myself: What is the worst that could happen? Empiricism is about “learning by doing”, so I challenged myself to have the courage to just write about this contradiction. I strongly believe to lead by example and make everything transparent unless there is really a reason not to. So by this post I want to show my courage, openness and commitment. These values helps me to create trust in the fact that this post will help me in my journey to the Mastery of Scrum. My mission is to truly live up to the values and practice what you preach. Now it’s your turn: What’s something you could be more transparent about but where obstructing thoughts are blocking you from doing so? Bertus Groenewegen, Proudly powered by WordPress.